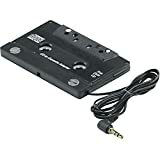 The Philips USA PH-62050 CD/MP3/MD-To-Cassette Converter lets you play CD, MP3 or MD players in your car’s cassette deck via a direct plug into your portable audio player. It’s powered by your car’s own electric system so there’s no need for batteries, and it produces a clean sound without the static found in most FM transmitters. I chose this product because it was made by Philips a well known and respected manufacturer. It is very simple to use. Put it into the cassette slot in my old van radio, connected my iPod and hey presto sound filled the cab. It couldn’t be simpler and has brought the radio up to date for very little cost.